In spring, I popped into Short & Strong in Charlestown, in need of refreshment whilst walking the coast path from Pentewan to Fowey. After a perfect coffee and delicious slice of cake in the café, I was amazed to see such a huge, beautiful restaurant upstairs: The Longstore. On reading the menu, I vowed to return, so I was thrilled when we were invited to dinner by the owners recently. We arrived in Charlestown on a gloriously sunny evening; the small harbour was bustling with locals and holidaymakers. Despite being only half an hour from home, we instantly felt as if we were on holiday. The Longstore is situated above Short & Strong, overlooking the harbour and its famous tall ships. The place is immaculate, warm and comfortable. In this warehouse conversion, industrial chic meets French farmhouse meets contemporary Cornish design. The lights are made from painted oyster shells by local ceramicist Sarah Hunkin. 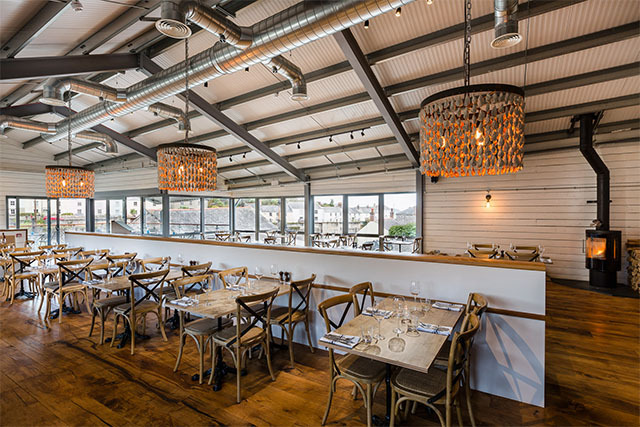 White timber cladding sits alongside metal girders and pipework, exposed brickwork and expansive glazing. A long banquette runs the length of the room, cleverly dividing the restaurant. Tables and chairs are more rustic, and very comfy; places were laid with soft, cotton, proper napkins, what a joy. The waitresses were superb. Smartly turned out in their denim aprons, all were polite, helpful and friendly. They worked calmly and efficiently, making sure that everyone was well looked after. The restaurant was almost full (amazing for a random Thursday evening) and bustling with couples and groups of friends. The atmosphere was buzzing, with a lovely hum of conversation, and background music at just the right volume. 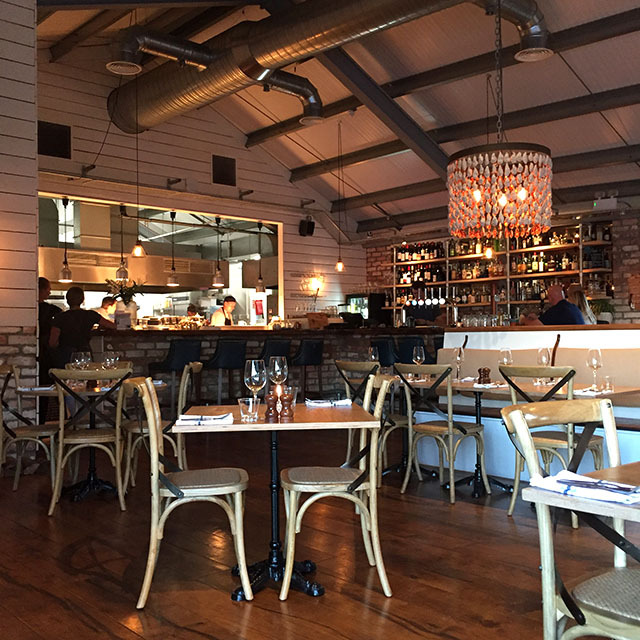 The menu is brilliant, almost entirely steak and seafood, with a selection of nibbles, starters, sides and salads. There is also a daily specials board. The wine list is extensive, with several wines available by the glass; this number will soon rise as the restaurant is introducing a wine preserving and dispensing system. I opted for a glass of Knightor‘s white Carpe Diem, made at the winery nearby. It was surprisingly light and fresh, dry and easily drinkable. So to the food. It was hard to see past the “potato shavings with aioli”. 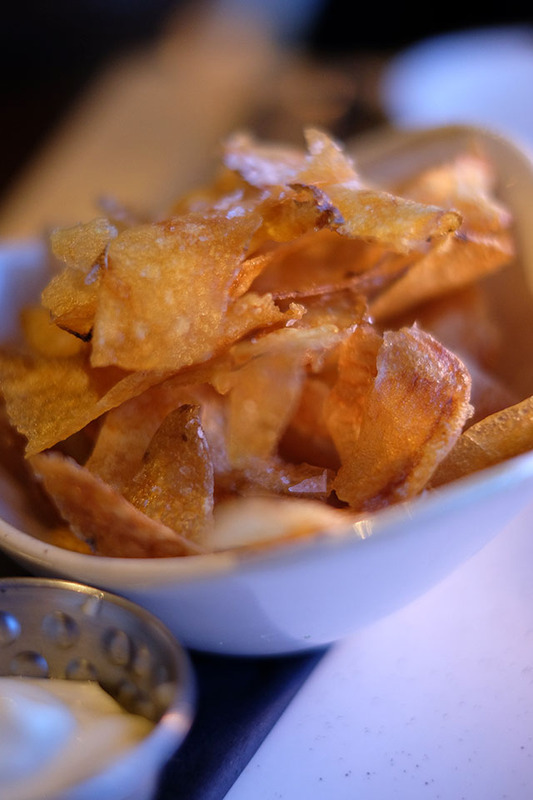 These were deep fried, wafer thin, slices of potato, served warm, and possibly the best crisps you’ll ever eat, especially when dunked into the garlicky mayo. We shared two starters; the first being the scallop dish from the specials board. 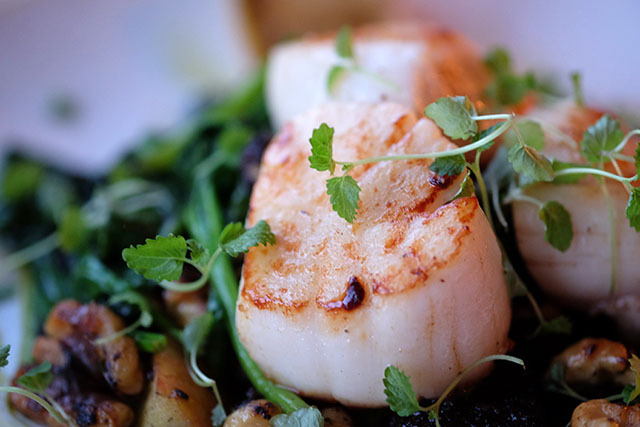 Three juicy, plump Mevagissey Bay scallops were lightly seared and served on a heap of crumbled black pudding, pieces of cooked apple, toasted walnuts and spinach. A wonderful combination of flavours and textures. 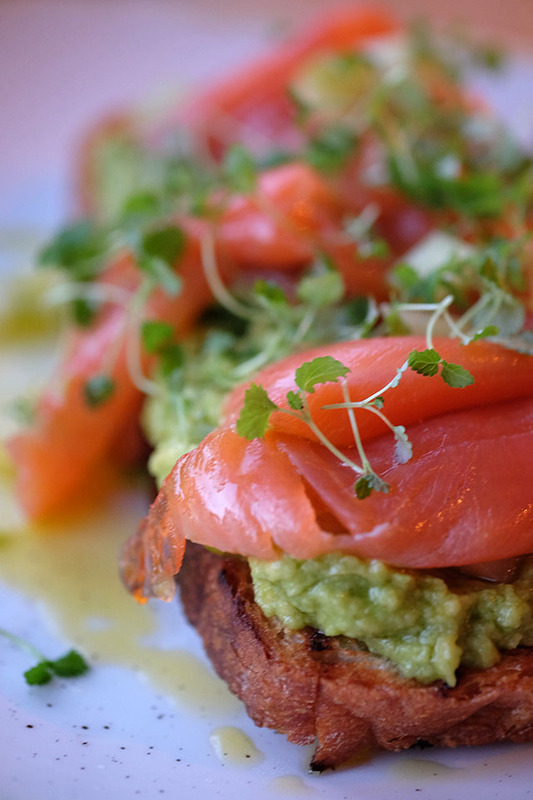 Our other choice was the salmon gravadlax bruschetta. This was a hugely generous portion for £8.50, and would be a great choice for a light lunch. The salmon was cured in house, and packed full of flavour. This sat upon a thick layer of crushed avocado on toasted Da Bara sourdough. The little pieces of sweet, zingy, pickled cucumber, and the perfect charred flavour of the toast, made this really special. Other starters on the menu that caught our eye were the crab and prawn cocktail, braised beef croquettas, and beef carpaccio, amongst others. See menu. All mains are served with a choice of side dishes: hand cut chips; skinny fries with rosemary salt; roasted garlic and parmesan mash; blackened sweet potato wedges with avocado aioli; new potatoes with mint butter; green beans, broccoli and peas with lemon butter; mac ‘n’ cheese fritter; feta, spinach and walnut salad. I opted for another dish from the specials board for my main course – pan fried John Dory fillets, with wilted spinach, potato rösti, and chilli and lime butter – along with a bowl of lemony green beans, broccoli and peas. The (three!) 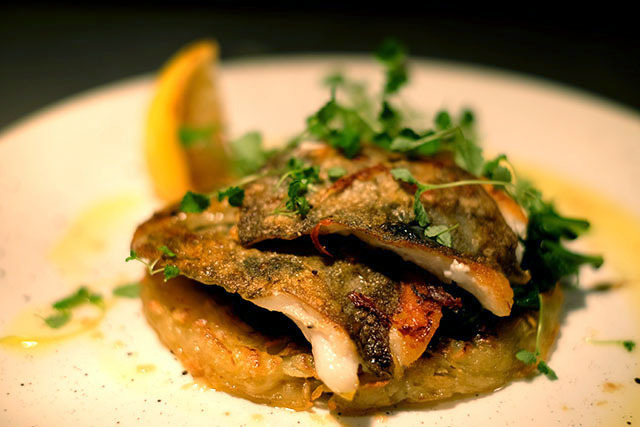 fillets of John Dory were beautifully cooked, with delicious, crispy skin and delicate flesh. The chilli and lime butter had a good kick to it, and the acidity of the lime kept the dish fresh. I love a good rösti, and this one was really moreish, crisp-edged, soft and unctuous within. Steaks (from butcher James Kittow in Par) are available as rump, sirloin or fillet, and served with roasted garlic and onion purée, crispy shallots and slow roasted tomatoes. 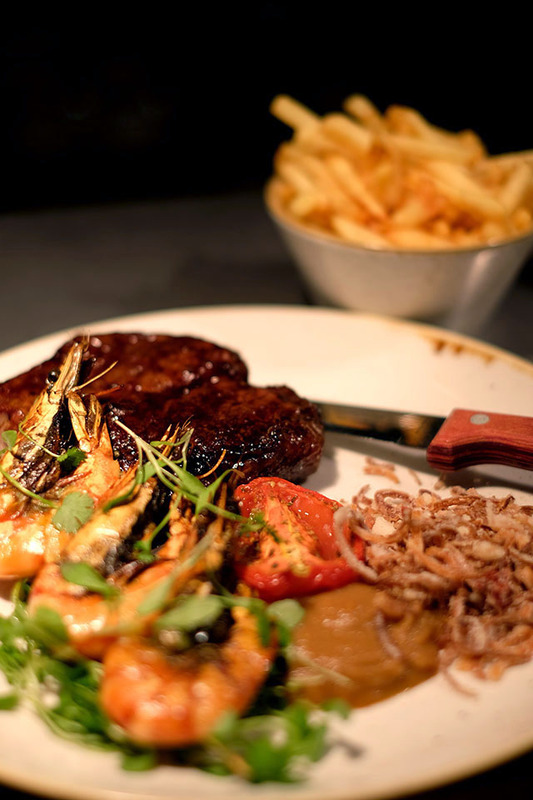 There is a choice of classic sauces, and you can “upgrade” your steak to surf ‘n’ turf, with a skewer of tiger prawns and garlic butter. The rump was ordered medium rare and the cooking judged to perfection; a good thick slice which was well-rested and, as a result, beautifully tender. By this point we were rather full, but couldn’t resist sharing a pud. On advice from our lovely waitress (we wanted something light) we plumped for the panna cotta with strawberry compote and shortbread crumbs. 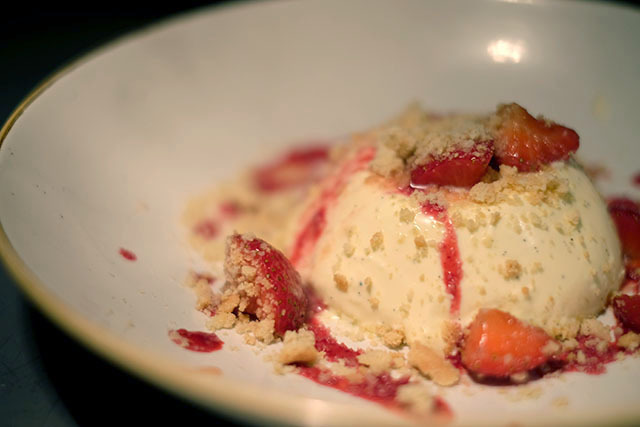 Made with clotted cream (ridiculous, I know) this was the lightest panna cotta I’ve ever eaten. Other desserts on the menu (that we’ll have to try next time) include a chocolate and hazelnut mousse with orange and honeycomb, a lemon meringue mess, and a hot buttered bourbon vanilla sundae with fudge chunks and pecans. 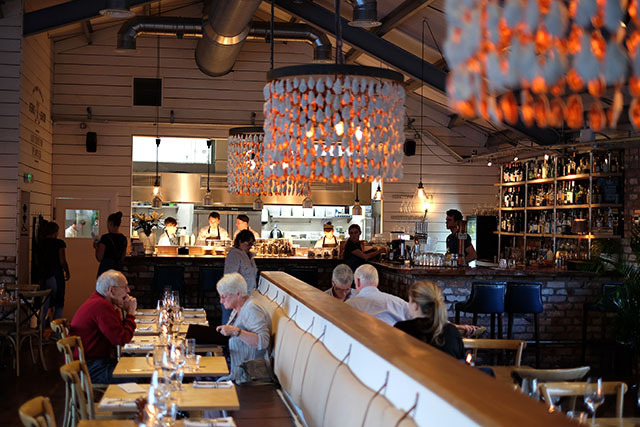 The restaurant is relaxed and inviting, and I can see The Longstore being one of our regular retreats. Located just twenty minutes from the A30 and ten minutes from the Eden Project, it’s easy to work it into a family day out: for Sunday lunch after a walk along the coastpath, or an early supper after ice skating at Eden. To be honest, I just want to go back and try everything else on the menu. 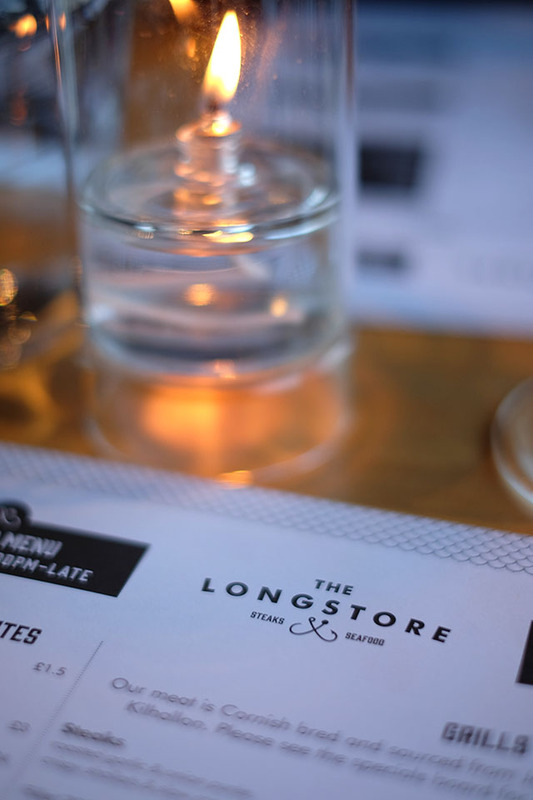 The Longstore is open every day for lunch between 12 noon and 3pm, and for dinner from 5.30pm until late. At this time of year, guests can enjoy a roast lunch from 12 until 3pm on Sundays, priced at £14/£9 for large/small portions. 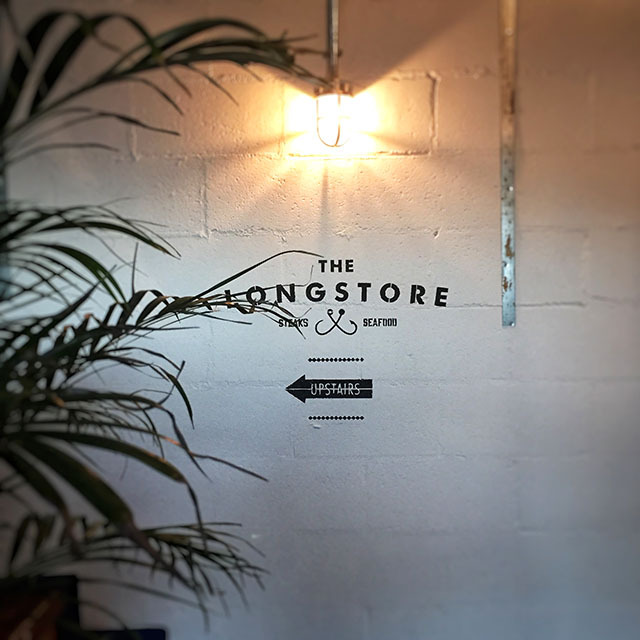 For more information visit thelongstore.co.uk or follow The Longstore on Facebook and Instagram. For reservations phone 01726 68598 or email [email protected]. 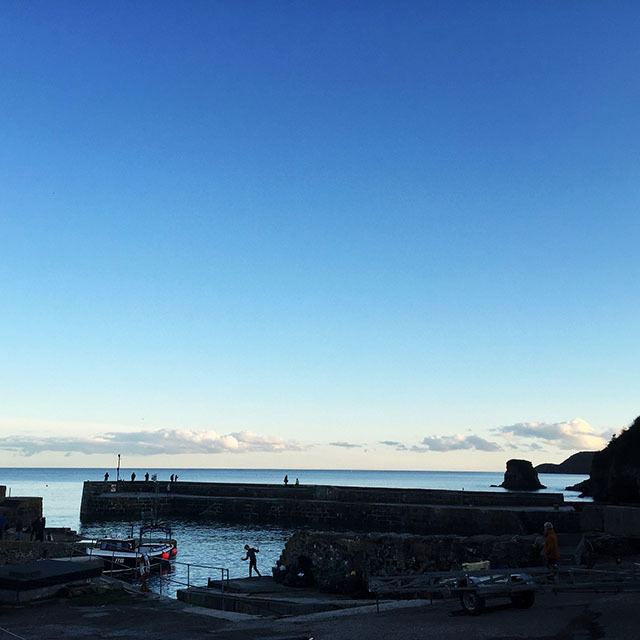 The Longstore is run by Pollocks Pub Co., which also runs The Sharksfin in Mevagissey, Short and Strong in Charlestown and The Golden Lion, Port Isaac. Disclaimer: We dined as guests of The Longstore. Thank you to John and his team for looking after us so well. All photos © Barefoot Media apart from first interior image.